Shallots look like small, elongated onions with copper, reddish, or gray skins. After they are peeled, they divide into cloves like garlic. Once peeled, small shallot bulbs will have two to three individual cloves and large shallots can have up to six cloves. In general, if the recipe calls for one shallot, use all the cloves within that single shallot bulb. Shallots are an excellent choice to use instead of garlic and onion because they offer a lighter, less pungent taste than garlic or onions. Shallots are low in saturated fat, Cholesterol and Sodium. They are an excellent source of Vitamin A which helps to improve vision and prevent night blindness. Shallots are a good source of vitamin B6 which is beneficial for maintaining a healthy nervous system and they are good sources of manganese, vitamin C, and potassium. When selecting shallots, they should be firm and heavy for their size, not dry and light. Look for ones that have no soft spots or mold. Sprouting shallots are an indication of age and should be avoided. The younger or smaller the shallot, the milder the taste. Large shallots will smell and taste more like their onion and garlic cousins. Shallots can be stored in a cool, dry, dark place with plenty of air circulation. Knot them in clean pantyhose, hang from the ceiling in a dry garage, cellar or closet, and they can last up to a month. You can also store shallots in a hanging metal mesh basket. If they sprout, you can still use them. Remove the bitter green sprouts if you don’t want a strong onion flavour. Many cooks choose to include the sprouts and use them much like chives. Shallots work particularly well in dishes using wine. They caramelize like onions and it is important to sauté them gently. Browning over high heat is likely to turn them bitter, much like garlic. You can roast shallots in their skins until they are soft. Cool them a bit and then peel them. Place them in a blender or food processor and puree them. The puree can be used as a flavour enhancer for soups, sauces and stews and roasted meats. 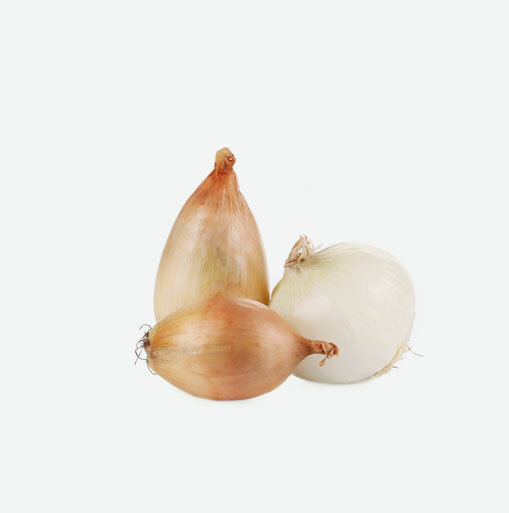 Did you know that you can substitute 3 to 4 shallots for one medium cooking onion?